Are your looking for Evaporative Cooling for your horse ? Keep your horses cool and at optimum performance. 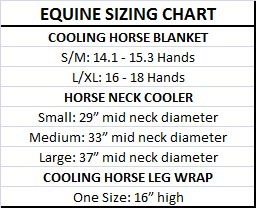 We offers a range of products for horses including cooling horse blanket, neck coolers and cooling leg wraps. Our cooling products for horses use the same cutting-edge technology behind our successful cool vests used by many top athletes. Your horse will feel 15°C cooler than the ambient temperature (depending on airflow). This will result help your horse perform at its best, with less risk of heat stroke and excellent recovery from exercise.